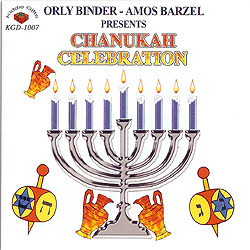 This new production of Chanukah(Hanukkah) music cd in English and Hebrew allows English-speakers to understand the meaning and customs of Chanukah(Hanukkah)-jewish holiday, as well as learn and teach Hebrew. It helps strengthen the connection between the home, the educational institution, community and the Jewish People. Your Chanukah celebration can be based on these on these songs. They refer to all aspects of the holiday: candles, the Maccabees, the temple, the miracle of the oil and the Menorah, playing with dreidels, traditional dishes and more.